This program allows you to collect force (kg) and rate of force (kg/s) data using the WBB, just as you would do with a load cell in a laboratory. 1. 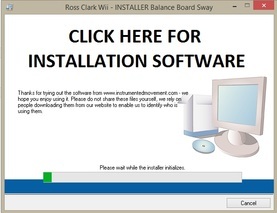 To operate the software click the "CLICK TO ZERO" button with the WBB in the testing position. This will vary depending on what sort of test you want to do, and you may want to zero it with the person in the testing position. For example, a recent article of ours examined big toe strength using one of the load cells. To do this the person was positioned with the WBB upside down and their toe resting on one of the sensors. The board was zeroed in this position to remove the weight of the toe from the test, otherwise this would have biased the test to give people with heavier toes higher scores. 2. Once you press this button you have to wait a few seconds for the program to zero. Once the red "CLICK TO STOP" button appears you are ready to apply force. Simply push against one of the sensors on the board (there are 4, located in each corner of the WBB) and you will say the graph rise. This program was designed for use with one sensor in the board, however you can also use it with 2,3 or all 4 of the sensors at once. It does however only provide one composite result. If you intend on using it for research purposes please calibrate the force data in the testing position you are using. Calibration is simple, just apply a series of known loads to the sensor and record the values that the program provides. You will need to wait > 5 seconds for each load because you want to record the Last Peak value once the force trace has stabilised. Do this with at least 3 loads, then put the known loads and recorded values into Microsoft Excel and plot a scatter plot with a linear line of best fit. Then use the regression equation to create your calibration factor. If you are unfamiliar with how to perform a sensor calibration you can refer to this page on our site.